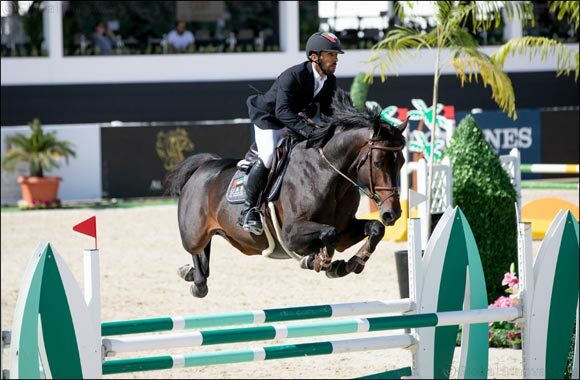 Abu Dhabi, UAE, 10 January 2019: The €250,000 four star Al Shira'aa International Horse Show got underway on Wednesday and it was UAE rider, Salim Ahmed Al Suwaidi who recorded the first victory of the four-day event Al Forsan Equestrian Centre. Al Suwaidi was landing his second win of the week having already steered his second horse, Snapp Jack into top spot during the one star show on Sunday. Partnered on yesterday (Wednesday) by his seven-year-old dark bay stallion, Diamond Way, Al Suwaidi sailed to victory in the 125cm-130cm Cavalor Young Horse Welcome Stakes with a clear round in a time of 56.83sec. Greek rider, Dimitri Natsis and his horse Cascall were second in a time of 58.17sec while the in-form Dane, Tina Lund was third on Celvita Z in 60.13sec. Al Suwaidi, who is based in Sharjah, said he would be competing on Diamond Way in the four star events at Al Shira'aa International Horse Show later in the week and hopes his success in Abu Dhabi would be a gateway to more victories around the world. The second class of the day, the Al Shira'aa UK Prize was held over fences of 130cm and won by Saudi Arabian rider, Abdulrahman Alnemr and his mare, Beverly Girl in a time of 51.12sec. Jordanian, Nasouh Kayali and Adette were third in 52.27sec while Lund was once again in the money, this time on Payse Heutiere in third with a time of 55.41sec. The evening session at the Al Forsan Equestrian Centre featured the YAS TV Speed Stakes and the Meadow Court Stud Qualifier, which qualifies riders for the show-concluding Longines Al Shira'aa Grand Prix on Saturday.